The letter is written to my grandparents, Professor and Mrs. J Henri Blanchard following the loss of their son (my uncle) Lieutenant J. Alfred Blanchard. The letter was written by his Company Commander, Major (later Brigadier) Allison W. Rogers. 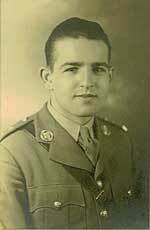 Lieutenant Blanchard was killed in action on 23 November 1943 in the Battle for Sangro Heights in Italy. He is buried in the Canadian Military Cemetery in Moro River Italy. This is a very hard letter for me to write to write to you as Alfred was a close personal friend of mine as well as a brother officer in the West Nova Scotia Regiment, but I feel you would wish to know the details concerning his death so I will endeavor to tell you as best I can. It was late in November and we were fighting the enemy in the Apennine Mountains. B Company, to which Alfred belonged was ordered to attack and capture a prominent hill surmounted by an old castle and monastery. His was the leading platoon in the attack and in the fierce fighting that followed many of his platoon were killed, wounded and taken prisoner. Alfred himself led the platoon right into the enemy stronghold and did valiant work before he was killed by machine gun fire. At first he was reported missing and we all hoped that he had been captured but the sad news reached us later that he had been killed. He was buried in the mountains of Italy beside some of his boys close to the scene of their gallant attack. If ever an officer was worshipped by his men your son certainly was - He had that gift of leadership mixed with a grand sense of humour that command the respect and love of the Canadian fighting soldier and the men of his platoon who managed to get back from the action have nothing but high praise for his gallantry and personal courage during the engagement. He died gallantly leading his men into action against very heavy opposition and he lies in a hero's grave in the heart of the Italian mountains. The Regiment has suffered a great loss by his death and I have lost a grand pal and close personal friend. The officers and men of the Regiment extend to you and Mrs. Blanchard their deepest sympathy in your great bereavement, to which I add my heartfelt sympathy in your suffering. If there is anything that I can do for you in anyway or if there is any further details you would like to know do not hesitate to write to me sir. May the passage of time and your great faith help you to bear the great strain and loss of your son.